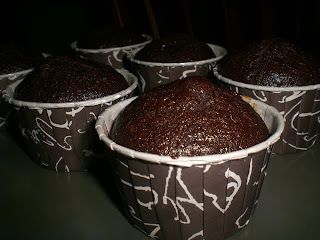 I really cant remember when was the last I baked and I totally miss baking so much. I NEED to get my baking mojo back!! 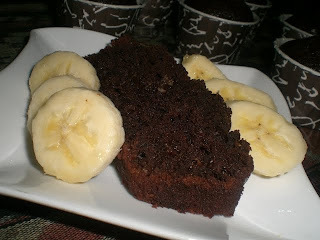 Here's my first bake for Year 2010 - Chocolate Banana Cake. I was supposed to bake this on Monday but I was hit by the lazy bug. Then I was hit by the flu bug yesterday. Yikes! Today, I forced myself to bake the damn chocolate banana cake which I had been meaning to bake since the start of the week. So with the assistance of my ever so helpful little helper, Tihani, we started to bake. Tihani helped mashed the ripe bananas and mixed the dry and wet ingredients. This was rather easy to put together, just like any other foolproof recipes I ever tried. Well, this was the result - a rich, moist, chocolatey cake with tender crumbed top and subtle hint of banana. Preheat oven to 175C. Grease a loaf tin. In a large bowl, combine flour, sugar, cocoa and salt. In another bowl, combine eggs, mashed bananasm water, milk, oil and vanilla essence. Pour the wet ingredients to the dry ingredients and whisk well till everything is combined. Note that batter will be thin. Bake in preheated oven for 40 - 50 mins or until a toothpick inserted into centre of cake comes out clean. I actually baked half of the mixture in a loaf tin and half in 6 standard sized paper cups.